1.5 ft. 3 ft. 6 ft. 10 ft. 25 ft. 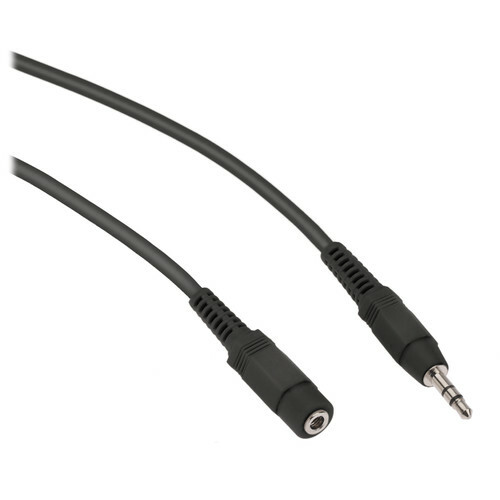 The 25' black Stereo Mini Male to Stereo Mini Female Extension Cable from Pearstone is a general purpose extension cable with a mini (3.5mm) male plug at one end and a female jack at the other end. It allows you to extend the distance between your smartphone, tablet, laptop or other audio device, and your headphones or speakers. Box Dimensions (LxWxH) 5.25 x 5.25 x 0.8"
Stereo Mini Male to Stereo Mini Female Extension Cable (Black) - 25' is rated 4.7 out of 5 by 45. Rated 4 out of 5 by Art Draco from 25 foot Stereo Extension Cable I use this to help record audio for inexpensive web commercials and house videos. I use this with the Rode Microphone and boom pole. I love it. It really helps me when the subject is not super close to the camera or I need to get multiple people in the frame. The down side is if my subjects are close or in a small room I use the 10 ft extension cord to help prevent trips over extra long cables. With the Rode microphone I purchased I was told not to get the 25 ft cable because the extra length would decrease the sound quality. I have tested it several times and do not detected any difference between this and the 10 ft cable. Rated 5 out of 5 by Serial Webber from Perfect for the Rode Videmic!!!!! This has been extremely useful. I've been shooting a web series on my Canon T2i and using this cable to connect my Rode Videomic Pro to my camera and mount it to a boom pole. This gives me 25 feet of space between the camera and the mic, meaning I can capture wide shots while still getting clear audio. I haven't had any problems with the chord whatsoever so far - it's worked perfectly. Rated 5 out of 5 by Japen G. from Worked as expected Used this to hook up a Rode video mic on a boom pole and there was plenty of slack. Audio came in clear and crisp. Rated 5 out of 5 by Navega Brasil Films from perfect for extend wired lavaliers mics I use this cable with my Sony ECM-CS3 Tie Clip Microphone to plug it directly in the camera. Works great. Rated 5 out of 5 by dmb01golf from Use When Subject Far Away Hooked up just great to my canon 7D mark ii with Rode Stereo mic. No issues at all. Rated 5 out of 5 by Kyle from Life's Too Short Sometimes life feels too short. Give it an extension with this 25' cable. Reach your dreams. Rated 5 out of 5 by Japen G. from A mount that just simply works! I have been looking for a universal mount for my Audio Technica wireless receivers on my dslr video rigs. This fit perfectly and having a couple of options on how to mount them on my rig is a nice feature. I can either mount them by the hot shoe or 1/4 screw on a smallrig cage. Rated 5 out of 5 by Randy from Great Gadget I ran this cord from a stereo inside my home to our front porch to listen to my iPod Touch, iPad, and phone on my outdoor speakers. It works great and I didn't need to cough up the money for a wireless setup. Seems well made and works great for my purposes. Can we used it for Audio Recording with Rode VideoMic Pro used with Nikon D-3300 DSLR Camera ??? Will this cable work with a Polsen VM-150 mic and a Canon HF R52 camcorder? Yes. We use these with our Polsen mics and our Canon R-500.Just make sure the R52 has a mic input on it.